Pump It Up is proud to offer Sensory Jump Time, a program for children on the autism spectrum and other children with special needs. Children who attend will have the opportunity to make new friends, jump, slide and play sensory-friendly games within a controlled, safe environment. This program is open to children with special needs and their siblings only. Advanced registration is encouraged as this program is not open to the general public in order to provide a safe environment for the children. 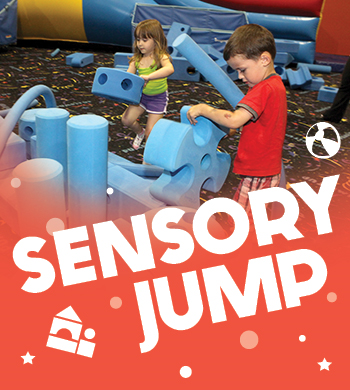 Our Sensory Jump is hosted on the last Friday of every month, currently 2:30-4:00 pm. Price is $10/child. Tickets are non-refundable nor transferable. Groupon and other passes are accepted for Sensory Jump. 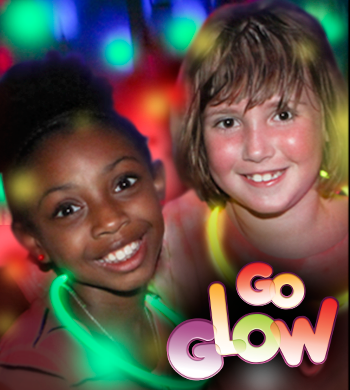 Our Special Glow Jump is open to kids ages 14 and under. Come enjoy our new, state of the art, glow lights; best in the area!! It's a 1 hour and 20 minute session inclusive of a rule video for safety purposes, fun jumping, climbing and sliding time with special FX lights and LED black lights the last 40 minutes all synced to the beat of energetic music. Open Glow Jump is an awesome experience kids will never forget! PLEASE NOTE- Glow will happen in Arena B only. Lights will remain on in Arena A.
Glow add-on is also available for our very popular, Pump It Up Parties- just mention during your next booking. Please note: Our facility follows a rotation schedule that is subject to change based on holidays, special events, parties and more. There is no guarantee as to which room you will be in when you arrive. If you want to have the best experience, arrive at the start of the jump and stay for a lengthy amount of time to get the best bang for your buck. Only one room is open at a time. Full price admission is $12 per child. Only 1 discount can be applied towards each admission when applicable. Punch passes ARE accepted for this event. Food & drink is NOT ALLOWED in our Arenas. Only water. Food & drink must be consumed in our lobby at our benches. Price is $12/child, Parents are FREE!! Check our Special Events Tab for more awesome events! Please note: Our facility follows a rotation schedule that is subject to change based on holidays, special events, parties and more. There is no guarantee as to which room you will be in when you arrive. If you want to have the best experience, arrive at the start of the jump and stay for a lengthy amount of time to get the best bang for your buck. Only one room is open at a time. Our sibling rate is our discounted rate. Full price admission is $12 per child. Only 1 discount can be applied towards each admission when applicable. Food & drink is NOT ALLOWED in our Arenas. Only water. Food & drink must be consumed in our lobby at our benches. 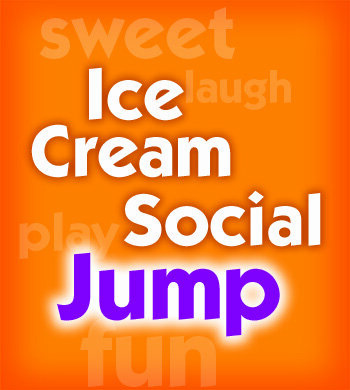 Bring the kids for a Fun Jump time in the glow lights with a "Dippin'Dots" Ice Cream treat that kids will enjoy! It's a 1 hour and 20 minute session inclusive of a rule video for safety purposes, fun jumping, climbing and sliding time with special FX lights and LED black lights the last 40 minutes all synced to the beat of energetic music. PLEASE NOTE- Glow will happen in Arena B only. Lights will remain on in Arena A. Each paying child will get an ice cream at the end of the Jump session. $15 per child includes Jump Session and Ice Cream! !